Steve Dolinsky isn’t the least bit bothered by the fact that his Chicago tours are remarkably cheesy. 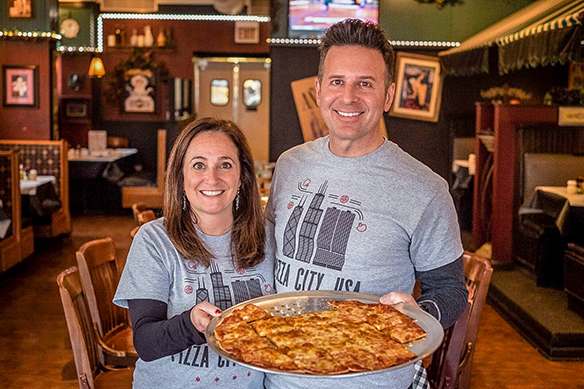 Dolinsky – in Toronto recently for a Chicago promotional event – launched Pizza City, USA in May, which has tours showcasing the city’s pizza offerings, with those types of tours being virtually unheard of in the United States, he says. Four tours take people to different eateries featuring the famed Italian food and showcase the districts they’re offered in. Dolinsky says Chicago is more closely linked with pizza than other US cities, in part because much of its population is of Italian descent. The city has become synonymous with deep-dish pizza – known for rich crusts – but Dolinsky says that’s only one side to its pizza scene. “People love to eat in Chicago. There so much more than deep-dish pizza,” he says. “Chicago definitely has a very unique and distinctive pizza scene – most all visitors know about deep dish and can’t wait to try it (and always do); and then most don’t know about the different styles and offerings in the city beyond deep dish. That’s what is so fantastic about visiting… you can try a different style pizza each time (and tons more culinary offerings) or you can take a tour and indulge in several different styles. And then keep coming back for more,” says Michelle Gonzalez, vice-president of media relations for tourist board Choose Chicago. Pizza City, USA has neighborhood walking tours on Saturdays and Sundays and a bus tour on Saturdays. The walking tours cost $49 and the bus tour $69. The three-hour tours have participants sample different pizza styles and participants can meet the owners of the eateries and visit the kitchens on the cheese-and-dough filled journeys. Vegetarians are accommodated and denoted by green rather than red badges given clients. Dolinsky – a food reporter – likes to sample pizza when visiting other cities, but doesn’t make his own as he lacks the proper oven at home. Some may be somewhat surprised that tours that showcase pizza alone will have a following, but Dolinsky says that’s only natural. “People want to eat,” he points out. The event was also told by Maggie McNamara of Broadway in Chicago that that city has a thriving theatre scene. “The big excitement in Chicago is we get things first,” she said. Among summer productions is Heartbreak Hotel, a showcase for Elvis Presley music. More information can be found at choose chicago.com.